How much will cost? Where are the stores? What are the rules? We've got your answers here. Quebecers are now able to purchase cannabis online and at a dozen outlets across the province. Ottawa left it to provinces to determine how marijuana would be produced and distributed on their territory, and Quebec has opted for some of the most restrictive laws in the country. Here is a breakdown of how it will work in the province. Cannabis for recreational purposes will be available at the newly formed, government-run Société québécoise du cannabis (SQDC), an offshoot of the province's liquor board, the SAQ. It will also be available for purchase online at SQDC.com. 970 Ste-Catherine Street West, near the corner of Peel Street. The SQDC is expected to open three more stores, including one additional outlet in Montreal, by the end of the month. A complete list of locations is available here. There are plans to open between 150 and 160 stores in the next two to three years. 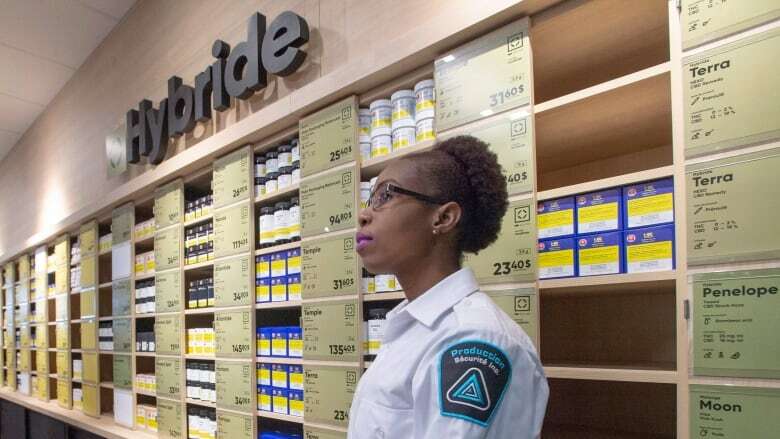 Stores and online vendors will offer dried cannabis (whole and ground), pre-rolled joints, oil and oral spray as well as THC and CBD gel capsules. The SQDC has contracts with six producers certified by the federal government. Edibles won't be available as they aren't part of the federal government's initial legalization plan. Dried cannabis is available starting at just over $5 a gram, with some strains closer to $10 a gram. Sales will be restricted to 30 grams at a time. Individuals are not allowed to have more than 150 grams in their homes. You need to be 18, for now. The incoming CAQ government is promising to raise the age to 21, but it won't have time to change the law before cannabis is legal. The CAQ has said it will make the change as soon as possible but has not provided a clear timeline as to when that will be. The CAQ was critical of the plan to set the legal age at 18 from the start, citing various medical groups whose research has concluded cannabis use can harm brain development in those under 25. Can I grow it myself? No. Quebecers won't be allowed to grow marijuana plants at home, even though the federal law allows Canadians to have up to four plants at home for their personal use. Where can't I smoke it? A lot of places. Smoking cannabis will be prohibited in the same locations as those set out by tobacco laws, as well as on the grounds of universities and CEGEPs, hospitals and schools. The incoming CAQ government wants to go even further, banning the drug in all public places. Quebec City, Sherbrooke, Levis, Saguenay, Victoriaville, Pointe-Claire and many other municipalities have either banned the consumption of cannabis in public or signalled their intention to pass bylaws to that effect. The City of Montreal will follow the current provincial law on cannabis. You will also be able to consume cannabis at public events, such as the Montreal Jazz Festival. But the boroughs of Saint-Laurent, Saint-Léonard, Pierrefonds-Roxboro, Montreal North and Rivière-des-Prairies–Pointe-aux-Trembles, all governed by the city's opposition party, Ensemble Montréal, are planning to ban smoking cannabis in public places. Some of the boroughs, including Saint-Laurent, plan to go further and ban the consumption of all cannabis derivatives as well. Those who don't follow the rules will be handed a ticket by police. What about apartments and condos? Some Quebec landlords and condo owners have banned smoking cannabis in their rental properties. A poll conducted recently by the landlords association suggested a majority of its members anticipate tenants will complain about marijuana smoke. A majority also indicated they plan to prohibit smoking marijuana inside their buildings. Some condo associations, as well, have introduced bans. What are the rules for driving? Quebec introduced a "zero tolerance" policy for those found to be using cannabis. In Montreal, almost 2,000 officers are trained to conduct roadside detection tests. If an officer pulls someone over and suspects the person is impaired, but not by alcohol, the person is sent to be evaluated by another, more specialized officer. They will have the option of a new drug saliva testing device to enforce laws against driving under the influence of cannabis, thanks to a go-ahead from the federal government. They will also be able to demand a blood test. Still got questions? Think we're missing something? Email us at webquebec@cbc.ca.